C-Line's long lasting and attractive biodegradable binder pocket will make your project extremely easy and organize. The strong, acid-free archival quality polypropylene includes an expandable 1 inch gusset for additional extra capacity. Polypropylene material means there are no photocopy transfer giving the best protection for your hard work. To ensure all your important materials are secure, the Velcro closure design locks the pocket shut. A clear finish protector offers a sharp, bright and bold presentation. ASTM testing certified product indicating this product will biodegrade in two to five years when buried in an anaerobic landfill. Help create a better world by using the C-Line Biodegradable Binder Pocket! Welcome to MyBinding video. 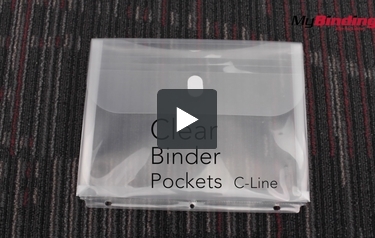 These are clear binder pockets from C-Line. To start off, here’s just a clear look the product. You can actually fit a lot of pages into this pocket. This is probably close to 250 pages. However, the seal will be close but fully functional. Anything remotely bigger than 8.5 x 11” paper won’t close in the pocket. These small books still have their binding on them. And when in a standard size binder, it extrudes out the side by about a centimeter and although my pages are protected and held in, some pages may get damaged because hollow pockets fold in for collapsing purposes. But if you’re looking for a basic 3-ring pocket, here’s one to consider. For more demos, reviews and how-to’s, go to MyBinding.com.